This course is designed and facilitated by an all-volunteer team with Designers for Learning, including professional instructional designers and other educators with years of subject matter experience. For more information about the team, the subject matter experts, and this project, please visit our website at designersforlearning.org/digitalinclusion. If you have questions about this course, please contact Designers for Learning. Thank you! 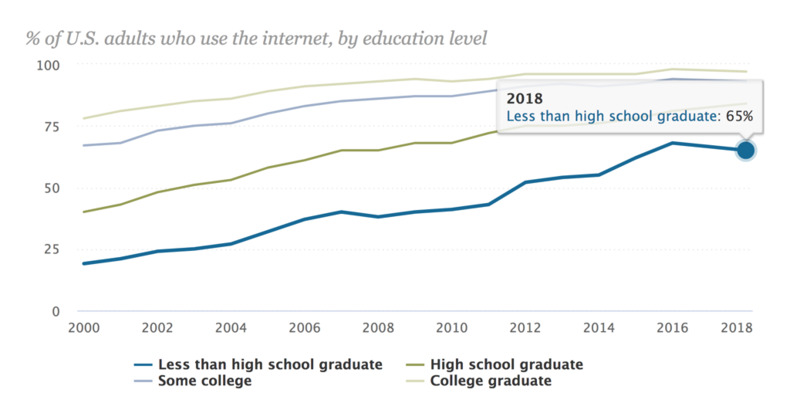 35% of adults without a high school diploma don’t use the internet. What will you do to support digital inclusion in your community? According to the Pew Research Center, roughly 90% of adults use the internet. However, not all benefit equally. Internet usage varies based on a variety of factors, including income, education, and community. For example, internet usage drops to 65% for adults without a high school diploma. This gap in internet usage makes it impossible for all individuals and communities to achieve digital equity. As defined by the National Digital Inclusion Alliance, digital equity exists when all individuals and communities have the information technology capacity needed for full participation in our society, democracy, and economy. What can you do to help your community achieve digital equity? How can you use your skills to support digital inclusion where you live while expanding your instructional design toolkit? Join us to find out. What are the costs & prerequisites? Prerequisites: There are no prerequisites for the course. How does the Design Challenge work? Access: The infrastructure a community needs to have in place in order to provide opportunities to benefit from digital life. Adoption: The individual barriers that make use of broadband technology less likely, even when access is available. Application: Specific purpose areas where the thoughtful deployment of broadband technologies can enhance the economic success of communities and the lives of their residents. Given this challenge is designed as a self-directed experience, you can spend as much time as you want to work through the materials and complete the project. To be successful in this Design Challenge, you should plan to devote at least 20 hours to work on the material. Like most experiences in life, the worth of the Design Challenge is related to the time and effort committed to it. Scope an instructional design project that you'll summarize in an Action Plan. Those who submit an Action Plan will have their work featured in an online Design Challenge showcase and will be eligible to join a future online cohort of designers who will connect and network as they implement their designs. Also, when you successfully complete the Design Challenge, you’ll receive a digital Service Badge to include on LinkedIn to acknowledge you have completed the instructional design process to support a social need. In other words, you've gained experience for good! For some, this project might satisfy an internship, service, or another experiential learning opportunity in their college program, depending upon the requirements at the school. As an added incentive, those who submit a completed Action Plan by January 2019 may apply to have their designs showcased at the fall 2019 Association of Educational Communication and Technology (AECT) convention. Maybe you’re attending or recently finished a college instructional design program, but want additional hands-on design experience. Maybe you want to change careers or you’re an "accidental instructional designer" and want to build your designer’s toolkit and a network of contacts. Maybe you want to carve out time for your professional development to make, try, experiment, share, compare, and create. Maybe you want a way to serve others. Whatever your reasons for participating, you'll leave this professional development challenge with an authentic service-based experience that you can showcase in your resume or portfolio. How will I network with others? While this challenge is a self-directed experience, you'll have the opportunity to share and compare with other participants enrolled in the course within a Gitter room. In addition, you can meet live with volunteers and other participants in our regularly scheduled optional live online sessions as part of our free Designer Dialogues webinar series. What have prior students said about our courses? Having a project-based course is helpful as I learn best when DOING something rather than just thinking about it. In the end, I will have a document that I can add to my digital portfolio. It has deepened my understanding of each phase of the instructional design process. I wanted to update myself on curriculum development. The course is set up well and the materials are excellent. The lesson planning activities are also excellent. As we read, we are able to think about the specific components of our lesson. In the discussions, I was able to read about other people’s various ideas. Also, I could build networks with people who are interested in the same issue/topic. Your course design is fabulous! I really appreciate how thoughtful and intentional you were in mapping out our journey. Thank you so much. I learned a lot about the design process. I am very honored to be a part of this course. I hope to be of more assistance once the course has completed. Please keep me in mind for future opportunities.